Kererū – You will often hear New Zealand wood pigeons before you see them – mainly because of the flap of their wings and the sound of branches in the forest canopy moving under their weight! Since the extinction of moa, kererū are the only birds with a beak large enough to swallow fruit from native trees such as taraire, puriri and karaka. Without kererū to disperse the seeds from these trees, our native forests could be in danger of disappearing. Kererū are known for their clumsy nature and will sometimes get ‘drunk’ after gorging themselves on ripe fruit. Kererū are long-lived and their nests are basically a few twigs put roughly together in a tree! You will know when kererū are breeding as you’ll notice the males performing spectacular swooping displays, often signalling the location of their nests. 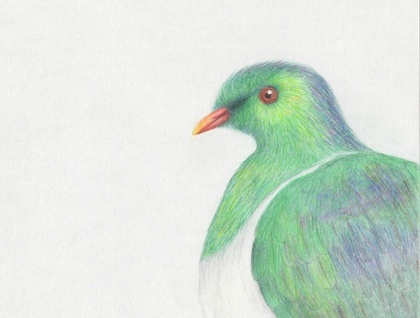 Visit www.projectkereru.org.nz to find out more about these big, colourful, and often clumsy, birds!